What social media channels are right for your non-profit and “what results and benefits can you reasonably expect”? What social media is, and why it might be useful. How goals, audiences and metrics drive decision-making. Specifics on the tangible value of Facebook, Twitter, Blogs, Photo- and Video-Sharing Sites, and more. Choosing an effective social media mix. Brainstorming tool possibilities and decide which channels are right for you. 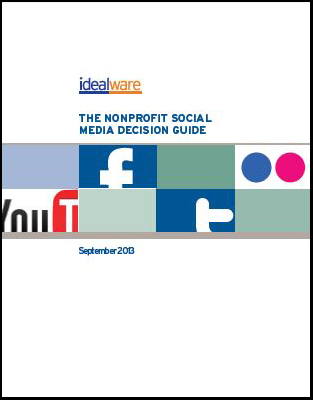 We hope Idealware’s Guide helps solve your social media challenges. Let us know in the comments below.